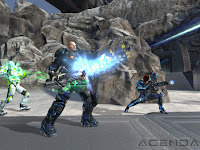 Cryptic Studios announced that Champions Online will go free-to-play in Q1 2011. The free-to-play beta will begin on November 9. Sony Online Entertainment announced today that a new free adventure service is coming to players worldwide with the release of EverQuest II Extended. The MMO follows the path of other names such as Dungeons and Dragons Online and Lord of the Rings Online. Quest Online announced that their fantasy MMORPG Alganon officially launched today. There were several modifications from the previous soft launch in December, including the dropping of the subscription model and even a revamped official website. Trion Worlds organized an event to present three MMO games that are already seen as very promising. The games are Rift: Planes of Telara, End of Nations and Syfy Action MMO. With the ongoing legal battle between Interplay and Bethesda for the Fallout MMO rights, the game is still being developed by Earthrise creator Masthead Studios. However, since Interplay has told their investors that their capital deficit is now at $3 million. Interplay may not be able to survive this situation, not even with a merger or a sale. This leads us to Fallout Online that was due for release in 2012, although nothing substantial was seen of the game. Other games may be cancelled, such as Earthworm Jim 4 or WiiWare titles Stonekeep and Descent. Gazillion Entertainment just announced that their MMORPG Marvel Universe Online will launch as a free-to-play game, in a strategy that is becoming more and more usual. High-profile games such as The Lord of the Rings Online, Champions Online and Dungeons and Dragons Online are also free-to-play, although they were released in retail. Marvel Universe Online is in development since 2009 by Secret Identity, a Gazillion Entertainment studio, and is using the Unreal Engine. Even if COO David Brevik didn’t reveal if the game was a client or browser-based title, all points to a downloadable client. And yet another high profile MMO is going free-to-play. Hi-Rez Studios announced that their shooter Global Agenda will feature a free-to-play option starting mid-April. The change will be introduced via an update named Free Agent, and there will still be a Elite Agent option costing $19.99. Sony Online Entertainment announced that they canceled their spy MMO game The Agency, as part of a restructuring that also led to the closing of three studios: Denver, Seattle and Tucson. The PC version launched in 2008 and Age of Conan was, just like Champions Online, another MMORPG that was planned for Xbox 360 but never made it to the stores. Trion Worlds released Rift in the US, with the European version scheduled for Friday. This fantasy MMORPG is set in the Telara, a world being torn apart. Rifts violently rip into reality across the land and release powerful forces that threaten the very existence of Telara. Each breach brings with it new characters, events, and treasures, while the world itself changes dynamically around you. There are three editions to choose from: Standard Edition, Digital Collector’s Edition, and Retail Collector’s Edition. Players are able to buy the game both in digital version and boxed copy, and purchases in the official website will offer an exclusive item, the Exemplar Armor Set. The boxed copy includes a bonus poster and game map. Masthead Studios is promising updates and expansion packs for the upcoming months, enhancing the game world. According to MCV, Star Wars: The Old Republic is set for a September release. This is the first BioWare MMORPG and is rumored to be one of the most expensive games ever, with a reported $300 million in development costs. Electronic Arts sees this game as a MMO that may stretch for ten years, but EA investors are not very confident on the success of Star Wars: The Old Republic. Electronic Arts just announced that they’ll co-publish The Secret World, the upcoming horror MMORPG from Funcom, makers of Age of Conan: Hyborian Adventures. The PC version is the only one yet announced, but an Xbox 360 adaptation isn’t still completely ruled out. Last year, Electronic Arts published MMO APB: All Points Bulletin, to a disappointed reaction by players and critics alike. GamersFirst bought the rights to relaunch the game as APB: Reloaded, a free-to-play MMO. Notorious Games set to launch MMORPG Xsyon Prelude on March 1st, 2011! Xsyon is a unique fantasy role playing sandbox MMORPG that allows players to create their own virtual realities as they form tribes, build towns, shape landscapes, create quests and build an economy. War has destroyed life as we know it. The Apocalypse is at hand! Will you fight for justice to stop the chaos or will you join in the ranks of evil to bring upon the ultimate destruction of the earth? Imagine yourself in an Apocalyptic world. Modern conveniences are a thing of the past. No computers, no cells phones, no electricity. You are among the few strong survivors, but you must gain skills and learn to survive in this harsh new world. Every day brings a new challenge as you are pummeled by the elements or find yourself hunting and foraging on your quest to thrive in this Apocalyptic world of creatures, mythical legends, and prophecies that are now all coming true. Explore this new world and join with other characters striving to survive, or claim a small plot of land of your own and visit tribal lands only to trade items and obtain quests. You may find communication and cooperation with other characters essential, or you can go it alone as you struggle against the harsh conditions that this savage land will thrust upon you. Work for good and build a prosperous new world or attempt to destroy what is left. Your path is one of choice. Will your actions help heal the planet or will you play a part in its ultimate doom? What will be the destiny of the Xsyon, the promised land? 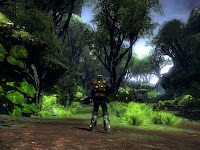 Xsyon is designed as an open ended sandbox MMORPG that evolves with its community. The Prelude is a limited first release of the Xsyon virtual world. An isolated basin, surrounded by mountains in a future American wilderness serves as the launching point for the ever expanding world. This setting provides a pristine environment for players to settle and develop a new online community and determine the future of Xsyon. Notorious Games is currently taking pre-orders for Xsyon: Prelude. - 2 months of game play after the launch. - A limited edition in game special weapon. - Immediate access to the final testing phase of the game. Masthead Studios is also working on Fallout Online, a game that stands in the middle of a legal battle between Interplay and Bethesda. WoW Cataclysm: 149 hours in one week! The top 11 per cent of players generated over 50% of all playtime in Cataclysm. The average playtime on the day of release was 6.23 hours and the average game length is 2.1 hours. 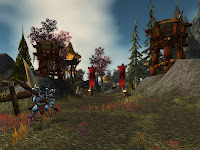 World of Warcraft: Cataclysm was released on December 7th and became the fastest selling PC game ever, with 3.3 million copies sold during the first day. Developers of the post-apocalyptic MMO, Fallen Earth, have partnered with several leading hardware providers, including AMD, Patriot Memory, Tt eSPORTS and Thermaltake to present the Fallen Earth Holiday Apocalypse Challenge this month! 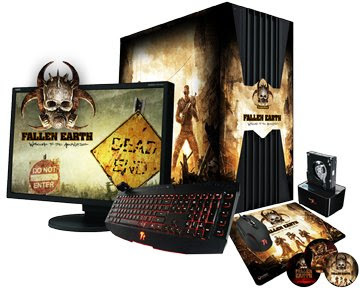 Players will have a chance to win a fully loaded, custom Fallen Earth PC, iPhone 4 and other awesome prizes! The Holiday Apocalypse Challenge begins today and runs through January 7, 2011. Players may visit www.fallenearthcontest.com to enter and will need to jump in game between now and January 7 for a chance to win! Each day players log in between these dates they’ll earn an additional entry. Additionally, the free trial period is temporarily extended to 30 days through January 7. New players are invited to download a free, 30-day trial at https://www.fallenearth.com/trial to participate.